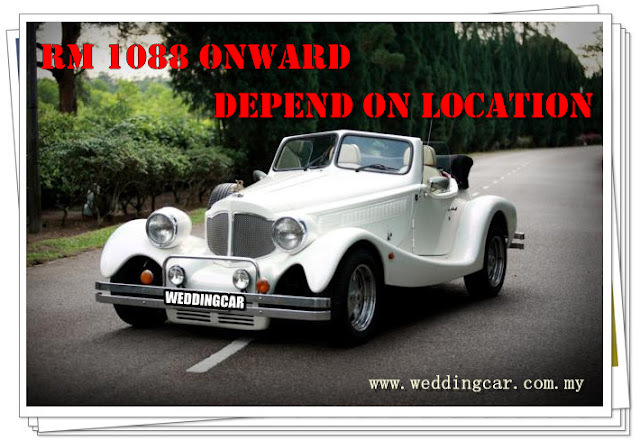 Wedding Car Rentals in Malaysia – One for the Boys! While the girls pine for the most beautiful gowns and banquet, what the groom really want for their big day are toys for big boys! So this article will take you through a vroom-vroom ride of various car rentals that provide that special ego boost during your wedding day. The prices stated below are all taken off their websites at the time of writing; so do check the sites for latest updates. http://www.bridalcar.com.my early bird offer starts at RM599 and they seem to only have ONE car; a TD2000. For something flashier you can try prestigelimo. The awesomely handsome cars come with chauffeured services. Considering that you are kings and queens for the day, you shouldn’t mind the handsome prices as well. Minimum period of rentals are 3 hours with 12 hour daily rentals also available. Ok, so maybe you don’t like “Uncle” looking cars, you can head-on over to http://www.redorcarental.blogspot.com/ and get yourself some SERIOUS wheels! A head turning Hummer 2! Only RM7000 for a Murcielago? Sign me up for that. That matte black with the red trim... yes please! With regards to your wedding day there is a colossal add up to design, yet a standout amongst the most vital components is wedding car rentals. There are numerous administrations offering transportation for your huge day, and here is a speedy manual for finding the administration for you. I find a very good website for the hummer rental , If you want you can visit this site.